How Much Does An In-Ground Trampoline Cost? This is not a trick question as many of our new customers ask, “how much does an in-ground trampoline cost?” and it’s not a one-size fits all answer. The costs range based on the style and size of in-ground trampoline you purchase, the quality of equipment, whether you’re a do-it-yourselfer and many other factors. What kind will you get? Shop around and do your research on the quality of options for your new in-ground trampoline. Galvanized steel frames are best for your in-ground trampoline because they are designed to resist rust and this is ideal when you’re placing the frame underground. This material is one cost to consider. Digging the hole for your in-ground trampoline. 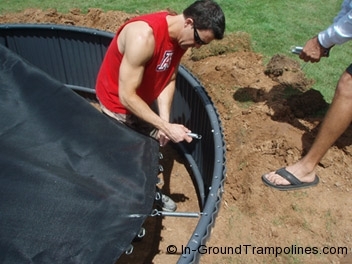 After you’ve decided on the size of your in-ground trampoline you can plan how deep the hole needs to be. Will you dig the hole yourself? What will you do with the dirt that’s been excavated? Do you have the skills to build the retaining wall? Remember, you can’t just dig the hole and place the frame inside of it without reinforcing the wall. Building this retaining wall, if you need to hire someone, will add to the price of your in-ground trampoline. Do you understand drainage for the in-ground trampoline and for your area in the yard where you will place it? You certainly don’t want to have any standing water in the hole where the in-ground trampoline is. Even if you invest in galvanized steel, it will be hard pressed to withstand constant water. You need to know whether the area you’re excavating will hold water or whether the drainage makes sense. If you have to hire someone to dig the hole, this will be one of the biggest costs for the project. This will be an added cost. How much will your in-ground trampoline cost? It’s not a one-size-fits all answer. Determine the price of the in-ground trampoline itself then determine what you can do on your own and what you need to hire a professional to do for you and you can put your budget together. Call us for advice and information on putting together a budget for your new in-ground trampoline.